MTG War of the Spark Booster Box Pre-Orders Available NOW! MTG War of the Spark booster box pre-orders are now available!! Cases are available for pre-order for $580 plus tax! 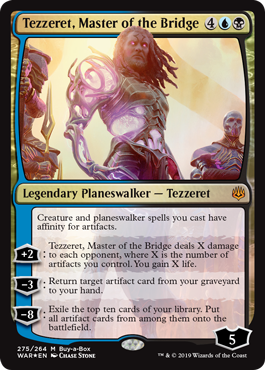 You also get the Buy-A-Box promo Tezzeret, Master of the Bridge with each booster box! This card is ONLY available as a WPN Buy-A-Box promo! You can’t pull it from a pack! You can pick up your War of the Spark boxes during prerelease weekend, April 27th and 28th! If you miss prerelease weekend, you’ll have to wait until the set releases on May 3rd! Posted in Blue Bell Store, Holmes Store, Magic: The Gathering, New Releases, Wilmington Store | Comments Off on MTG War of the Spark Booster Box Pre-Orders Available NOW!